Horticultural fleece is very light fabric which allows light and water to pass though it but at the same time it traps in heat below. 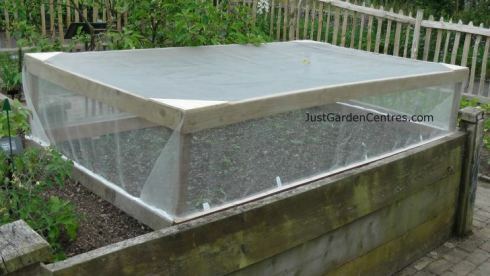 By trapping in the heat it can protect tender plants from several degrees of frost. It can be put in place and taken off easily and if treated correctly will last three or four years. In general it can extend the growing season by two to three weeks at the beginning and end of the season. The major difference between horticultural fleeces is the weight of the fabric. In the UK the two most common weights for frost protection are 17g per sq metre and 30g per sq metre showing how light the material really is. The heavier the fabric the more frost protection it can give. In general, the 17g horticultural will protect plants down to -2°C and a 30g fleece will protect plants down to -5°C. These figures are not guaranteed because they depend on many factors including wind speed. Remember, it is quite possible to fold over a 17g horticultural fleece which will effectively give you a weight of 34g and the corresponding frost protection. Aside from the increased weight, the downside of larger fleece weights is that the heavier the fleece the more light is cut out from getting to the plants underneath. Frost protection is not the only use for horticultural fleece however. Even where a frost is not threatened, any increase in temperature around plants helps many of them grow better. The other use is to protect plants against insect and small pest attack at key stages of their growth. Where pest control is the key aim, there are even light fleeces available. The normal mesh size on horticultural fleece is 2mm, small enough to prevent most insects getting at your plants. Although not very strong, horticultural fleece is more than sufficient to protect plants from attacks by birds. One of the principals of horticultural fleece is that it can be laid directly over a crop and the crop will still be able to grow normally underneath it. This is true in most cases with fleeces up to 20g and even 30g fleeces for use over a week or so. Where cover is required over a longer period of time it can be useful to support the fleece. The above example of a supported horticultural fleece looks like it was made by a perfectionist! But then again, it does look good and it will certainly last several years. In truth the fleece can be supported by any number of structures dependant on how long-lasting you want it to be, A common method of support is plastic tubing used for plumbing. It's cheap, long-lasting and does an excellent job. Horticultural fleece most definitely needs to be well secured down, even small winds will easily blow it away. The very cheapest method of securing it is to dig a small trench around the covered area, place the edges of the fleece in the trench and cover with earth. The problem with this solution that it is difficult to remove and replace the fleece. A line of spare bricks strategically placed over the fleece around the edges does a good job of securing the fleece. It is also relatively easy to remove the fleece and replace it. Many companies which sell horticultural fleece also sell various mechanisms to secure it to the ground. These are obviously a more expensive ssolution but are well worth investigating. A very handy site even for the old timers who have to jog the memory. Thanks SRS. Does fleece raise soil temperature before planting? Didn't find this out from the otherwise good stuff here, so only 4*. Thanks though. ANSWER: Thanks for your comment. Horticultural fleece does warm the soil temperature but there are better ways of doing that. Black plastic is the cheapest and most common method. Cloches also raise soil temperature very well.